Each student started off creating a stop motion animation using the free web based program, JellyCam. Students have since used iPad apps such as Toontastic, PupetPals and Little Birdie Tales to create narrated digital stories and animations. This spring, we’ve introduced Bee Bots, programmable mini bee robots, to learn basic computer programming. We’re following a STEM curriculum created by Judy Robinson Fried, which includes lessons exploring concepts in math, literacy, social studies and art. 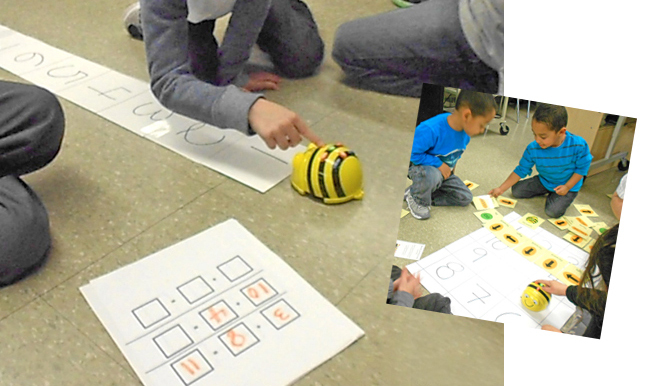 Students were introduced to the concept of programming, beginning with basic commands to move the Bee Bot (right, left, forward, back). Using a basic square number mat, students were tasked with making the Bee Bot move to different numbers. We then jumped into addition and subtraction problems using a straight number line mat, where groups would have to program the Bee Bot according to each problem. For example, if the equation was 2+3, the correct command entered on the Bee Bot would be: clear, forward, forward, pause, forward, forward, forward, go. The Bee Bot would move 2 steps, pause, and continue 3 more steps to land on 5, where it would beep happily at his destination!